Duval Fence Company provides only the highest quality wooden fences to the Jacksonville and surronding Duval County area including Orange Park, Mandarin, Arlington, Jacksonville Beaches, Ponte Vedra, St. Augustine, Duval County, Clay County and St. Johns County. There are many different uses for Residential wooden fences. Wood residential fences can add value to your home as well as security and privacy where you need it most. You can choose from many different styles such as all American white picket fence, shadow box or saddle cut. Wooden fences are very popular Easily customized. 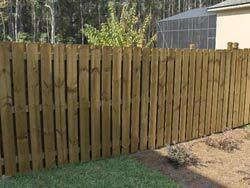 Residential wooden fences are typically used as ornamental fencing around your garden, or as a privacy barrier for your pool, patio, spa or hot tub, as well as a privacy barrier around your entire property. Wood is the most versatile fence which can be custom cut for height and painted to match any surrounding. Contact Duval Fence today (904) 260-4747 or by email to get a free estimate on a new wooden fence!